The impressive Georgian great house pictured here is known as Rose Hall, built in the eighteenth century. 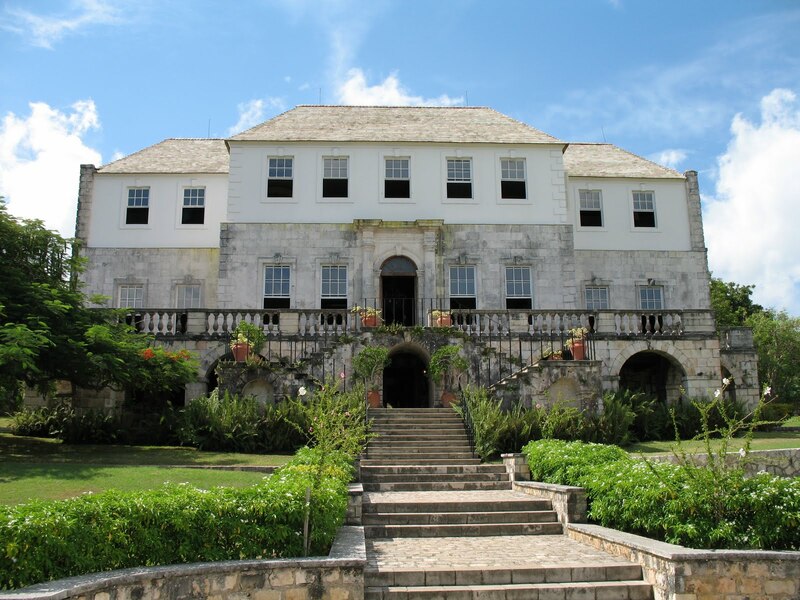 It sat on a thousand acre sugar plantation in Montego Bay, Jamaica. 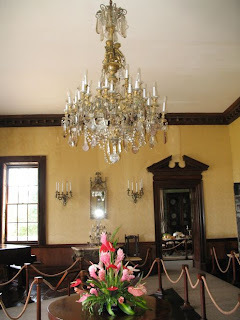 Rose Hall is known to be haunted by the former mistress of that plantation, Annie Palmer, also known as the White Witch. Very little is known about her and what is known appears to come from decades of local legend that paints a picture of an exceptionally cruel woman who not only routinely killed her slaves but killed her three husbands as well. There isn’t a lot of documentation to back it up but the people of Montego Bay believed her to be a powerful voodoo practitioner. It is said that Annie Palmer was born in Haiti to European parents. When they died of yellow fever when she was ten-years-old, she was placed in the care of her Haitian nanny, who taught her everything she knew about voodoo. It is also said that she only grew to be four-foot-eleven. 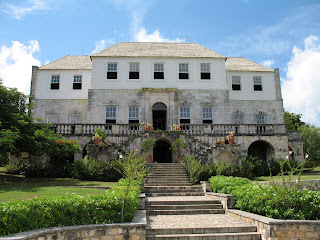 Marriage brought Annie to Jamaica where she lived at Rose Hall amongst the slaves who worked the fields and cared for the needs of her and her husband. She was alleged to have found life on the plantation terrible and dreamed of the fast-paced, interesting life in grand European cities like Paris. At some point, her dreams became resentment toward her husband. He suddenly turned up dead and the people of Montego Bay suspected it was by Annie’s hand. A woman left alone to run a thousand acre sugar plantation had little choice than to cultivate a tough image or she would leave herself open to those looking to take advantage of her. Annie took her tough image to the extreme. 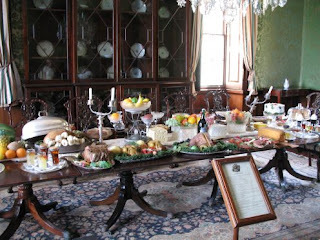 Every morning, Annie went to the back balcony of the great house where her slaves assembled in the garden and she delivered her orders for the day, which often included beatings, punishments and executions. She also began taking slave lovers, forcing men who struck her fancy to satisfy her sexual needs. She lived in the lap of luxury while the people who cared for her needs suffered and feared they would be the next to die. Annie played with her slave lovers like toys but tired of them quickly. Once she tired of them, they were due to meet their deaths. A man forced into her bed knew that his days were numbered. Voodoo was widespread in the region and people knew that she practiced it with skill, making her reputation grow. 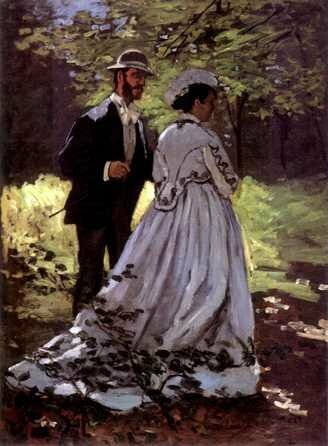 She married two more men who certainly were foreigners unaware of that reputation until they too turned up dead under mysterious circumstances. I have heard two stories of how Annie died during the slave uprisings of the 1830s. One story is that she was killed by her slave lover in her own bed out of the knowledge that if he didn’t kill her, she would certainly kill him. The other story is more complex. Allegedly Annie’s slave overseer (a slave himself) was quite a powerful practitioner of voodoo himself and his daughter was engaged to marry another slave. Annie’s lust fell on that slave and she took him for her own lover. The overseer wanted to protect his daughter from getting hurt so he planned to have Annie killed. She killed her lover the first night she took him to her bed and it enraged the overseer, who fought her and killed her in return. Other slaves prepared a grave with voodoo rituals meant to contain her body and soul so she could not rise from the grave and harm more people. The ritual, however, was done incorrectly and so was born the ghost of the White Witch of Rose Hall. A great many people since then have reported ghostly activity in the great hall of both Annie and the slaves she tortured and killed. The great house sat in ruin for two hundred years but was purchased by a man in the twentieth century who built a Ritz-Carlton Hotel on the grounds and overhauled the great house. Workmen began reporting that their tools were moved, disappeared, reappeared, etc. They heard voices when there was nobody else there, they heard footsteps and the sounds of babies crying. In the tales of Annie’s voodoo practices, she allegedly sacrificed the babies of her slaves and their cries can still be heard today. Eventually the only workmen to take the job were not from Jamaica. Once the great house was opened for tourists, they too began reporting the disembodied voices, mysterious footsteps, apparitions, physical touches and so forth. The basement was turned into a bar and restaurant for the tourists, but in Annie’s time, she used the basement to contain uncontrollable slaves. Many were killed. Shadow figures have been seen in the basement and there are reports of liquor bottles moving, as well as footsteps, all phenomenon of which is generally attributed to the slaves who were held there. Annie herself most often manifests as the sound of hurried footsteps through the hall toward the back of the house and she is also reported to try and physically seize people as they come into the house. She has also been seen riding a black horse on the grounds and wearing a green riding habit, whipping anybody who gets in her way. The most famous and frightening way Annie manifests is through one of the only mirrors remaining in the house that was present in her lifetime. A great deal of tourists have sent pictures to Rose Hall of this mirror with what appears to be manifestations of a woman in the reflection. Several can easily be debunked but some are chilling in what they are supposed to show. 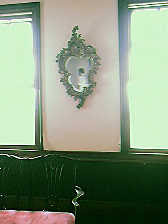 This is an example of one of the alleged ghost photos of Annie Palmer reflected in her mirror. What do you think? Is this a woman or a trick of the light? 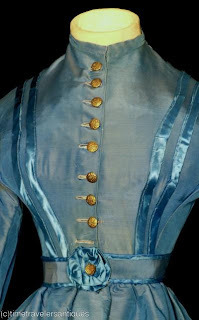 Today’s dressgasm struck me as so much like my own style of the period that I intend to replicate it right down to the soft, yet vibrant blue color if I can ever find the right fabric. 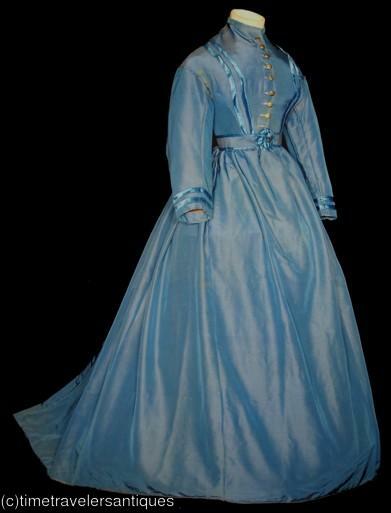 This dress dates to 1866, which is a year after the Civil War ended. At that time, the female silhouette was beginning to shift from the exaggerated wide shoulders and skirt with the narrow waist to the more elongated, natural shape of a woman’s body. If this dress had been made before or during the Civil War, the decorative stripes on the bodice would have been wider set – more horizontal than vertical – and the shoulder seams would have been dropped a bit more. In order to replicate this dress for Civil War reenacting, I will have to do those simple alterations to the design. I believe the main fabric is silk taffeta based on other silk taffeta dresses I have seen. The decorative stripes might be satin or another fabric that would be extremely shiny compared to the silk taffeta. The buttons on this dress may or may not be original to the dress, but if they are, they are gold and quite fancy. The lady who wore this dress had some money at her disposal. Belts were quite popular in the mid-nineteenth century and could be attached to the bodice, skirt, or totally unattached. Many belts were made of the same material as the dress, while others were black or another contrasting color. This belt has a rosette, which is a gathering of fabric made to look like a flower. Rosettes were a popular design on belts and as other decorative pieces on dresses.